It has been a challenge for me to make my husband eat Pongal. He never touched it whenever I tried it in Bangalore. I had never made it at home. The success rate with my friend Poornima’s recipes is almost 100% at my home. So I asked for her Pongal recipe and tried it. As always, this was a huge success. My husband and I loved it so much that, we had it for breakfast, lunch and dinner on a weekend. 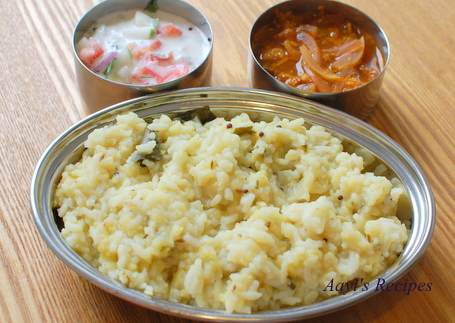 “Pongal” is a semi solid dish, usually prepared with rice and daal. We make “sweet Pongal” and “spicy pongal“. I loved the combination specified by Poornima. She serves Pongal with a sour side dish called as “HuLi gojju” or a kind of raita called as “Mosaru bajji“. But I prepared both the sides. Pongal is a one pot healthy dish prepared with rice and moong dal. It is the ultimate comfort food for many. Soak daal and rice separately. Crush black pepper roughly (I used black pepper powder instead). For best results, make the Pongal directly in cooker. Heat oil in cooker, add mustard seeds, cumin seeds and when they start popping, add curry leaves, crushed black pepper, green chilies. Fry for a minute. Add onion and fry till they turn brownish. Drain water off the daal and add it to the onions and fry for a minute. Now drain off the water from the rice and add it to the mixture and fry for few seconds. Add 8 cups of water (for 1 cup rice, 8 cups of water should be added. When I took above picture, I used just 6 cups of water to make it slightly thicker, but usually I prefer using 8 cups). Add coconut, chopped coriander and salt. Close the lid of the cooker and cook for 2 whistles. The Pongal should be in semi-liquid state when cooked. Serve hot with HuLi gojju or Mosaru bajji. When they start popping, add curry leaves and chopped garlic. Fry for a minute and add onions. Fry till onions turn slightly brownish. Add tamarind and around 2-3 tbl spn of water. Add chili powder, sambar powder, coconut, chopped coriander leaves and salt. Cook for around 7-8 mins. This gojju should also be semi liquid. I made it a bit less-watery to suite my taste. Mix cucumber, onion, tomatoes, coriander leaves and chili with salt. Add yogurt(curd) and mix well. Heat oil and add mustard. When they start popping add curry leaves, fry for a minute and them to the yogurt mixture and mix well. Adding onion is a nice idea. Thanks for sharing. i love this hot pongal, mostly saturdays I prepare this as a brunch at our home. The Spicy Pongal sounds really good, i;ve never made it with onions and coconut! Will try it! The spicy pongal looks really good, i never tried mosaru baggi with pongal. Next time i will try it and by the way i love your site, its very nice. Thank you for your spicy pongal recipe. Just like you, my husband too would not like the pongal I make. So I made it just the way you side with both the sides. It came out really good. We finished all of it in a day. Your recipes are very reliable and I am a frequent visitor of your site. Please keep up the good work. i think 1:8 water is more because i prepare sweet pongal and i use only 4 glasses of water. Swapna, 1:8 water is required for this pongal. I have measured it and thats what I added when I took the picture. I tried this recipe last weekend and it was great. And the 8 cups of water is definitely required — I think I only added about 7 and was forced to add some more water in after the cooking proccess to make it a little less solid. Lesson learnt! The only extra thing I added were some cashews fried in ghee — gave it a great crunch. Wonderful recepie , I wud have called my mom instead. It saved my time n money thanks. This dish is a super hit at my place. All of us love this so much that I’ve started making this once a week… and the huli gojju goes very well with pongal. The other day we visited my cousin and she had made Pongal, she did not know about huli gojju. I made it at her place and everybody just loved it. I gave her this website.. and she tried out this version of Pongal, and said it was great! Thanks for this recipe. Do you have a good recipe for sweet pongal? Pel, I am so happy to know you liked it :). It is indeed a very refreshing side for many dishes. Thanks a lot Vani. We call the sweet pongal as khichdi. 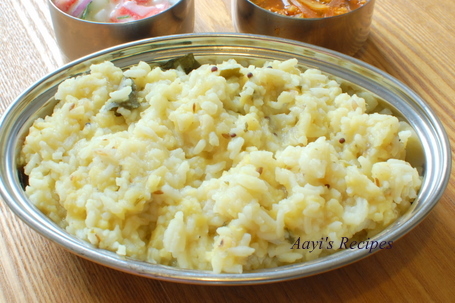 Have a look at sweet khichdi recipe. Tried khaara pongal and a big change from the regular pongal. Including onion, garlic, loved it so much. trying pongal for the first time and just loved it. Was a bit skeptical about the 8 glasses of water there..but its definitely required. Thank you so much for sharing this delicious recipe. 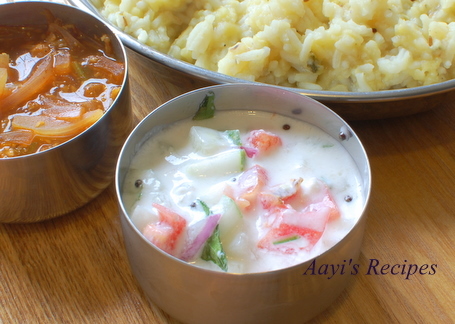 i tried the pongal and raita…came out very tasty. I am not a pongal fan but i simply loved this one. This Pongal has become one of the favourite dish of mine and my husband…. This tastes awesome.Could you tell me if the Huli Gojju could be prepared without adding onions? Shilpa: Sahana, as of now, I do not have any other recipes for huli gojju. If I find something, I will post it. thanks! very much for this recipe–my husband really liked it! The listed recipe has given me the best results….. I am in love with the dish ….. I prepare the pongal in the same way as you have mentioned with little variation in ingradients. I use more whole black pepper and less green chilley (1 or 2). I think powderd black pepper gives very different taste. Also adds little crushed ginger just before the onion turns brown for better taste. Hope you can try this variation. This recipe is awesome. I and my friends used to be a constant visitor of ISKCON temple back in Bangalore during my college days just for the spicy pongal they used to give as prasadam. Today when I made it using your recipe, it is exactly of the same taste and brought back lot of good memories. Awesome, great going. Keep posting more recipes. I have never known we can add coconut and onions! I made this dish today adapting this recipe. It turned out to be quite eatable. Thanks. I cooked moong dhall and rice last night in a pressure cooker. (I am famished when I come home from work and like to the time consuimg stuff the previous day.) I fried the spices (including onions), added the cooked dhall and rice, added water and heated the whole thing for a while. (I added water because the recipe said that the pongal should be semi-liquid.) The result was quite good. I have problems with frying spices. Lately I have started using low heat and things have started getting better. I put mustard seed and cumin seed to start with. It took forever for the mustrad seed to pop. However, the cumin seed did not burn. Next time, I am going to put the cumin seed after a while. I don’t put much oil for health reasons. This may be one reason why I am having problems with frying. Thanks for a very good recipe. My Pongal always turns like cake..some says roast the da..some says dont! is soaking needed? how long is it to be soaked? Shilpa: Do you mix it a lot while or after it is cooking? because mixing it again and again would make it like a paste. I do not see any other reason for which it may become like rava. Good recipe. My mom and MIL don’t make the semi-solid version of Pongal which I love. I followed the above recipe without onion and it still came out awesome. Our stomachs were full but cravings wasn’t. Thanks for the recipe…very good measurement of water to rice ratio. I tried pongal and Huli Gojju. It came out very tastey. Thank you very much for the recipe. heyy shilpa , i truely love ur website, though i rarely cook , i just love ur pictures of each dish, they all so appetizing n tasty!!! Hi, just wanted to know for how long should we soak the rice and dal? Many thanks, am eager to try this recipe. We lov this hot pongal..with Mosaru bajji …thnx for the recipe..
With little ginger (1 inch finely chopped) it tastes great. with half spoon of cumin powder in that would make it wonderful…. I prepared pongal and gojju today afternoon for lunch,it has come out very well.Thank you very much for sharing this healthy and wonderful recipe.Keep up good work. Hmm. I guess the Bangalore style pongal is different from Tamilnadu style. The pongal in TN is in the same consistency as rice in pulav. i have tried preparing pongal many a times.The first time I prepared it it got burnt at the bottom due to less water.Next time I added 5 cups of water and again it got burnt.Each time it gets burnt a little at the bottom of the cooker.How do I avoid this?Please tell me the exact ratio of water to be added and the time to cook it and at what heat.I place the weight when I close the lid.The kitchen is equipped with electric stove(with 1 to 9 and Hi). Shubha, please follow the recipe once and see if that works for you. It is mentioned in the recipe to use 8 cups water for 1 cup rice. Thanks for the recipe. I tried it and came out very well and tastes awsome.8 cups of water is what i used. Today made this pongal recipe as given and it was outstanding. I usually do not like coconut in savories, but the past four years of proven testing by the other cooks convinced me to try it. Also I needed to convince my husband a committed abstainer of pongal to try it again. I used an immersion blender after it was finished to make it creamy and blended like porridge. The coconut still gave it texture. Well he consumed three bowls! Says he now LOVES pongal. Many thanks for all you do and may your family continue to be blessed, especially its newest member! “cook for two whistles.” Could you please tell me what kind of cooker you are using? Receipe look very good – plan on trying tonight and am wondering about cooking times. Happy New Year to you. It’s been a while since I visited your site, so have a lot of recipes to catch up on! Anyway, I really liked the Huli Gojju recipe and plan on trying it out this weekend. Shall let you know how it turns out. Thanks to your website, cooking has become quite easy for me. Hey Shilpa,I love ur blog. I am from South Kanara too and ur blog allows me to recreate many old recipes without having to call home for a consult. 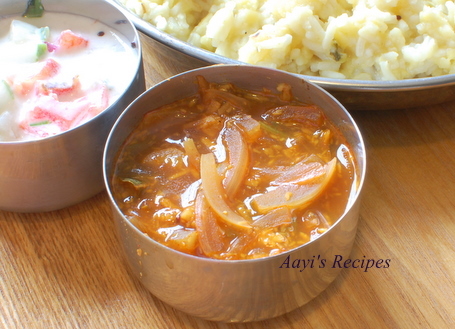 Btw,while I was web searching,I found ur exact same recipe for Huli gojju copied verbatim,on this blog http://myrecipes-aditi.blogspot.com/2009/03/huli-gojju.html .Are u aware of this? Hold on,the pongal recipe seems to be the same too. Check out if other recipes have been copied as well. Hope this helps. kolkatage bandu ondu wara aste. Illi ella galeeju. Mane tindi tinno ase adre cleanlyNess sigalla. Ee site Tumba helpful. Thanks. Try to embed video. Im not sure when you posted this – nanna experience haangey ithu. Kolkata asthu galeeju naan nodidilla- nanna friend oblu idhlu -bangalore indha avalu kelsakke bandidhlu- avalu maney li sakaathagi adigey oota aagthithu.one komala vilas place we used to visit,swalpa parvagilla alli.This site is very helpful. I am preparing sweet pongal and khara pongal for some years now, but your receipe is slightly different, tomorrow is Shankranthi, I will try your receipe, I am sure our family will enjoy it. Awesome. I used ghee intead and use full pepper intead of powder, more than recommended … Dhammmaaal…. Do v need 2 add turmeric powder to Pongal.